1973: Motorola completed the first handheld cellular phone call. 3 April 1973: Motorola engineer Marty Cooper (pictured here) made the first handheld cell phone call to Joel Engel, a rival from the research department at Bell Labs. Cooper made the call on a DynaTAC phone that weighed in at about 2.2 pounds and was 10 inches long. The first fully automated mobile phone system for vehicles had been launched in Sweden by TeliaSonera and Ericsson in 1956. Named MTA (Mobile Telephone system A). This was the first time calls could be made and received in the car while using the public telephone network. Before 1973, mobile telephones were limited to phones installed in cars and other vehicles. In 1947, an engineer at Bell Labs named William Rae Young proposed that radio towers arranged in a hexagonal pattern could support a telephone network. Young worked under another engineer named D.H. Ring. Young's design allowed for low-power transmitters to carry calls across the network. It also accounted for handoffs, which is when a caller moves from one tower's broadcast radius to another. But though the theory was sound, the technology to make it happen was lacking. It would take more than 10 years for the next development. By the 1960s, Bell Labs engineers Richard Frenkiel and Joel Engel developed the technology to support Young's design of a cellular network. But as AT&T sought permission from the Federal Communications Commission (FCC) to develop a cellular network, Motorola (their competitor) made the bold move in 1973 of making the first cellular based phone call. By 1981, the first generation of mobile telephone systems known as Nordic Mobile Telephone System emerged in Sweden and Norway. 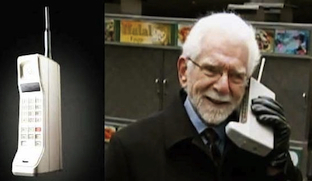 Osten Makitalo, who is know as the father of the mobile telephone, said “NMT was the first modern telephone system, the mother of all mobile telephones. Everything after that are actually just copies.” Initial NMT phones were designed to mount in the trunk of a car, with a keyboard/display unit at the drivers seat. Although Cooper and his colleagues had filed a patent for a "radio telephone system" in October of 1973, the DynaTAC 8000X phone did not become commercially available until 1983. The DynaTAC 8000X was the first mobile telephone that could connect to the telephone network without the assistance of a mobile operator and was portable for the user to carry about. It cost about $4,000 to purchase.